This topic describes the built-in scheduler in Azure AD Connect sync (a.k.a. sync engine). This feature was introduced with build 1.1.105.0 (released February 2016). 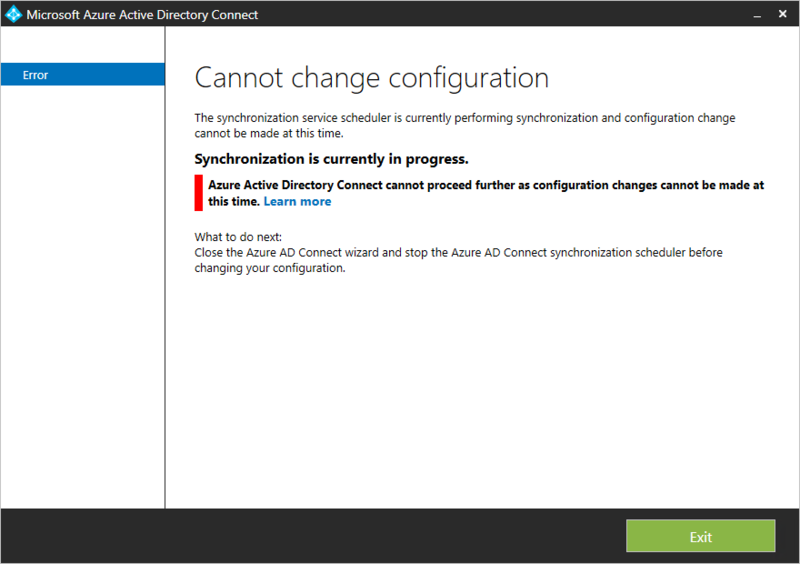 Azure AD Connect sync synchronize changes occurring in your on-premises directory using a scheduler. There are two scheduler processes, one for password sync and another for object/attribute sync and maintenance tasks. This topic covers the latter. In earlier releases, the scheduler for objects and attributes was external to the sync engine. It used Windows task scheduler or a separate Windows service to trigger the synchronization process. The scheduler is with the 1.1 releases built-in to the sync engine and do allow some customization. The new default synchronization frequency is 30 minutes. Synchronization cycle. The process to import, sync, and export changes. Maintenance tasks. Renew keys and certificates for Password reset and Device Registration Service (DRS). Purge old entries in the operations log. The scheduler itself is always running, but it can be configured to only run one or none of these tasks. For example, if you need to have your own synchronization cycle process, you can disable this task in the scheduler but still run the maintenance task. If you see The sync command or cmdlet is not available when you run this cmdlet, then the PowerShell module is not loaded. This problem could happen if you run Azure AD Connect on a domain controller or on a server with higher PowerShell restriction levels than the default settings. If you see this error, then run Import-Module ADSync to make the cmdlet available. AllowedSyncCycleInterval. The shortest time interval between synchronization cycles allowed by Azure AD. You cannot synchronize more frequently than this setting and still be supported. CurrentlyEffectiveSyncCycleInterval. The schedule currently in effect. It has the same value as CustomizedSyncInterval (if set) if it is not more frequent than AllowedSyncInterval. If you use a build before 1.1.281 and you change CustomizedSyncCycleInterval, this change takes effect after next synchronization cycle. From build 1.1.281 the change takes effect immediately. CustomizedSyncCycleInterval. If you want the scheduler to run at any other frequency than the default 30 minutes, then you configure this setting. In the picture above, the scheduler has been set to run every hour instead. If you set this setting to a value lower than AllowedSyncInterval, then the latter is used. NextSyncCyclePolicyType. Either Delta or Initial. Defines if the next run should only process delta changes, or if the next run should do a full import and sync. The latter would also reprocess any new or changed rules. NextSyncCycleStartTimeInUTC. Next time the scheduler starts the next sync cycle. PurgeRunHistoryInterval. The time operation logs should be kept. These logs can be reviewed in the synchronization service manager. The default is to keep these logs for 7 days. MaintenanceEnabled. Shows if the maintenance process is enabled. It updates the certificates/keys and purges the operations log. StagingModeEnabled. Shows if staging mode is enabled. If this setting is enabled, then it suppresses the exports from running but still run import and synchronization. SchedulerSuspended. Set by Connect during an upgrade to temporarily block the scheduler from running. In earlier builds of Azure AD Connect, isStagingModeEnabled was exposed in Set-ADSyncScheduler. It is unsupported to set this property. The property SchedulerSuspended should only be modified by Connect. It is unsupported to set this with PowerShell directly. The scheduler configuration is stored in Azure AD. If you have a staging server, any change on the primary server also affects the staging server (except IsStagingModeEnabled). Changes the scheduler to run every 3 hours. Changes change the scheduler to run daily. If you need to make configuration changes, then you want to disable the scheduler. For example, when you configure filtering or make changes to synchronization rules. To disable the scheduler, run Set-ADSyncScheduler -SyncCycleEnabled $false. When you've made your changes, do not forget to enable the scheduler again with Set-ADSyncScheduler -SyncCycleEnabled $true. The scheduler is by default run every 30 minutes. In some cases, you might want to run a sync cycle in between the scheduled cycles or you need to run a different type. It could be that you have an urgent change that must be synchronized immediately, which is why you need to manually run a cycle. If you need to manually run a cycle, then from PowerShell run Start-ADSyncSyncCycle -PolicyType Delta. To initiate a full sync cycle, run Start-ADSyncSyncCycle -PolicyType Initial from a PowerShell prompt. This command starts a full sync cycle. When a sync cycle is running, you cannot make configuration changes. You could wait until the scheduler has finished the process, but you can also stop it so you can make your changes immediately. Stopping the current cycle is not harmful and pending changes are processed with next run. Start by telling the scheduler to stop its current cycle with the PowerShell cmdlet Stop-ADSyncSyncCycle. Start Synchronization Service from the start menu. Go to Connectors, highlight the Connector with the state Running, and select Stop from the Actions. The scheduler is still active and starts again on next opportunity. The cmdlets documented in this section are only available in build 1.1.130.0 and later. If the built-in scheduler does not satisfy your requirements, then you can schedule the Connectors using PowerShell. Invoke-ADSyncRunProfile -ConnectorName "name of connector" -RunProfileName "name of profile"
The names to use for Connector names and Run Profile Names can be found in the Synchronization Service Manager UI. The Invoke-ADSyncRunProfile cmdlet is synchronous, that is, it does not return control until the Connector has completed the operation, either successfully or with an error. This order is how the built-in scheduler runs the Connectors. You can also monitor the sync engine to see if it is busy or idle. This cmdlet returns an empty result if the sync engine is idle and is not running a Connector. If a Connector is running, it returns the name of the Connector. In the picture above, the first line is from a state where the sync engine is idle. The second line from when the Azure AD Connector is running. If you start the installation wizard, then the scheduler is temporarily suspended. This behavior is because it is assumed you make configuration changes and these settings cannot be applied if the sync engine is actively running. For this reason, do not leave the installation wizard open since it stops the sync engine from performing any synchronization actions.